When you have something as important as a contract or other legal document that you need translated from or into another language, you need to be able to trust that the completed translation is accurate and that all specialized legal terminiology and jargon is accurate and will be accepted by any official or legal agent reviewing it. Not just any translator or agency is able to provide these services, but Translation Services USA is. With over 15 years of providing contract translation for lawyers, companies, businesses, and government agencies both in the United States and abroad. When translating a contract, accuracy is of the highest importance. A single mistranslated word can and has invalidated an entire contract when brought under scrutiny by a judge or another party. In addition to accuracy of the meaning of the text, the translator will also need to know and follow rules for contract internationalization, making sure that the format of the contract and the correct definition of specialized legal words, phrases, and other terms is conveyed accurately so that it can be accepted as a legal document by government officials. 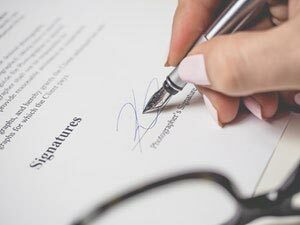 Finally, one of the key steps of contract localization is notarization, where the translator affirms that his or her translation is accurate to the original text, and a witnessing notary public adds a seal or stamp, affirming their claim is valid. Foreign governments require this seal to assure the accuracy of the translation, and in America, federal, state, and local governments require this as well. Translation Services USA always has a notary public on staff and ready to certify the validity of the translator's word who has translated a contract on behalf of our clients.